BAHAWALPUR: The police have rejected the impression, surfaced on social media calling Bahawalpur oil tanker inferno incident as retribution of lynching and setting ablaze a man in Chanigot near city for desecrating the Holy Quran in 2012, and termed it fake. The statement issued by Bahawalpur Regional Police, says the incidents in 2012 and Ahmedpur Sharqia have no resemblance or link. It said the lynching and burning of the man both took in Chanigot, the area 30 kilometers far from oil tanker explosion place. 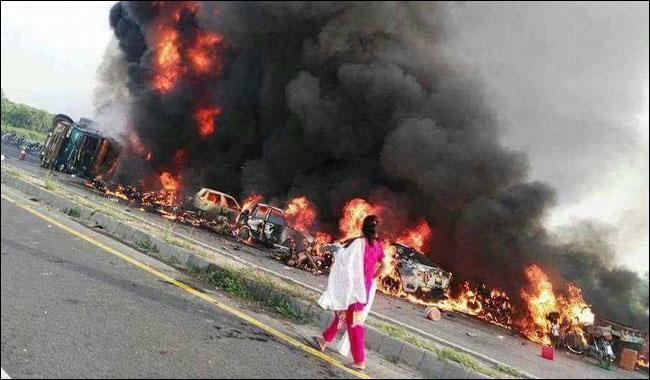 It further said the people martyred in the Ahmedpur Sharqia oil tanker explosion had also no link with the incident in Chanigot. The news posts circulating on social media are fake and fabricated, the statement added. In 2012, a Muslim man identified as Ghulam Abbas was beaten to death before his body was set on fire by an angry mob of hundreds for desecrating the Holy Quran. The accused was in police custody when the mob attacked. A mob of hundreds gathered and surrounded the police station and when the police refused to hand him over, the mob attacked the police station. The crowd broke in and seized Ghulam Abbas and dragged him to the location where he had allegedly desecrated the Quran. He was beaten to death before his body was set on fire. Two FIRs against more than 1,000 people had been registered in connection with the attack.